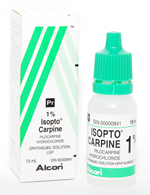 A brief description of the most commonly used eye drops is provided below. Possible side effects of each of these drugs are also listed. This is not meant to be an exhaustive list of side effects. For more information, we recommend that you consult your pharmacist or Google the drug name. You can prevent most bodily side effects by pressing in the corner of your eye next to your nose for about 30 seconds, after applying the eye drops,. This prevents the drops from draining through your tear ducts, into your nose, mouth and throat and affecting your body. If you think you are experiencing any undesirable side effects or an allergic reaction (redness, swelling of lids, itching) from any of these drugs, you can stop the medication, and call the office for a follow-up appointment to ensure that other treatment options are considered and that you are being monitored. If you are experiencing any severe symptoms like shortness of breath, wheezing, extreme fatigue or extreme facial swelling, you should STOP the medication and call 911, or go to your local emergency department immediately. IF YOU ARE PREGNANT OR PLANNING TO BECOME PREGNANT OR NURSING, SOME OF THESE MEDICATIONS MAY NOT BE SUITABLE FOR YOU: PLEASE NOTIFY YOUR DOCTOR. MAKE SURE YOU UPDATE YOUR DOCTOR WITH YOUR CURRENT MEDICATION LIST TO AVOID DRUG INTERACTIONS. DO NOT SHARE your eye drops with other people for what you think may be related problems. Shared use of medications can cause damage to the eyes. For example, if someone is unknowingly using a steroid eye drop for weeks to months, (s)he may develop high eye pressures that lead to vision loss. High eye pressure that comes on slowly does not usually cause pain, therefore this person maybe losing vision slowly without having warning signs. Dispose of your eye medications: by returning them to the pharmacist or your eye doctor for safe disposal. For information on proper application of eye drops or ointment, please see the relevant sections. These medications are in the same class of drugs called the "hypotensive lipids". These are eye drops that are used by dropping one drop into the affected eye(s) at bedtime on an ongoing basis to decrease eye pressure. You may be prescribed any one of these drugs to begin glaucoma treatment, and possibly switched to a different drop if the first one that is tried is not getting your pressure low enough. These medications work by increasing the drainage of fluid from your eyes through an alternate drainage pathway. Common side effects of this group of medications are: REDNESS, DARKENING AROUND THE EYES, LENGTHENING OF EYELASHES AND POSSIBLE DARKENING OF EYE COLOUR. The redness usually gets better after a few weeks. You can reduce the darkening around the eyes by wiping the drop residue with a wet tissue (instead of a dry one). This darkening is a temporary effect of the drug and will disappear if the drug is stopped. Eye colour sometimes may become darker over time with use of these types of medications and does not usually change after these types of drugs are stopped. These medications can also cause your eyelashes to grow longer and fuller while you are on them. Interestingly, a cosmetic product called LATISSE ® has been developed for increasing eyelash growth and is derived from bimatoprost. These medications are not recommended for women who are pregnant or planning to become pregnant (barring exceptional circumstances). Generally speaking, this class of drug is very well tolerated. However, if you are finding that they are too irritating to your eyes, you can stop using the drug, and call the office to arrange a prompt follow-up to consider treatment options. We recommend that you do not stop them just because of the redness they cause, if this is the only issue, since this will improve with time, as your eyes get used to the drug. These are all BETA-BLOCKER type eye drops that work to lower your eye pressure by decreasing the production of fluid inside your eyes. It is like turning the taps down when a sink is blocked to decrease the build-up of water in the sink. In a sink, the water overflows over the edges, whereas in the eye, the fluid build-up causes the eye pressure to increase because the drainage channels cannot keep up with the increased amount of fluid to drain. The pressure builds up inside this "closed" system. The gel form is used once a day in the morning and can cause temporary blurry vision (10-15 minutes), and the drop forms (all the rest) are used every 12 hours in the affected eye(s). Possible side effects of these medications can include tiredness, fatigue, shortness of breath and increase in wheezing in patients with Asthma or COPD (being treated with inhalers), temporary impotence in men (only while on the drug) and depression. Certainly, if you have a history of Asthma, COPD or depression, you will likely not be offered these drugs or any of the combination drugs that include beta-blockers in them (although Betoptic ® may be considered for use since it usually has less of a respiratory side effect). These medications are not recommended for women who are pregnant or planning to become pregnant (barring exceptional circumstances). If you develop any of the above side effects, please stop the drug and call the office for a prompt follow-up appointment to consider alternate treatment options. This is an alpha-adrenergic agonist type of drug. They work like beta-blockers in that they lower your eye pressure by decreasing the production of fluid in the eye, thereby decreasing the build-up of fluid and the increase in eye pressure that goes along with fluid build-up. 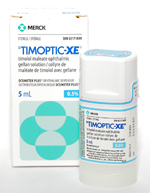 This drug is used 2-3 times per day in the affected eye(s). Possible side effects include tiredness and fatigue. 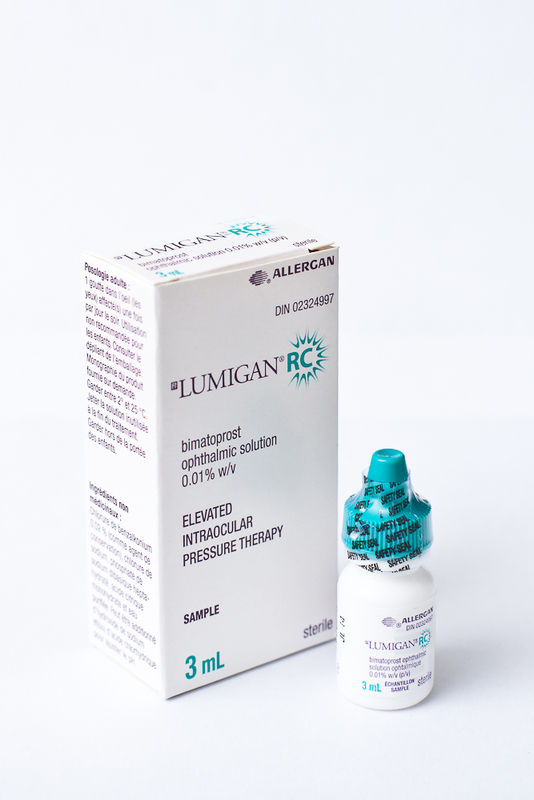 Since these drugs can have more severe effects in small children and petite, elderly persons, they are usually not used in these cases (although they may be tried barring other better options for treatment especially in the case of advanced glaucoma). These medications are not recommended for women who are pregnant or planning to become pregnant (barring exceptional circumstances). 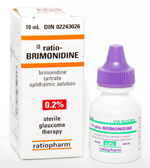 There is an increased likelihood of developing a drug allergy to brimonidine. Allergic symptoms can develop at any time, even years after using this drug without problems. They usually involve profound redness, itchiness of the eyes, and sometimes puffiness of the lids. If you experience allergic symptoms or fatigue while on this medication, stop it and call the office for a prompt follow-up appointment to consider treatment options. 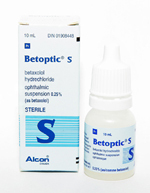 These are sulpha-based eye drops that are applied to the affected eyes 2-3 times per day. They are in the class of drug called carbonic anhydrase inhibitors. These medications work to lower eye pressure by decreasing fluid production in the eyes (like beta-blockers and brimonidine). 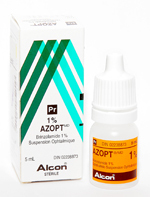 Both tend to sting the eyes when applied (Azopt ® is a little less stingy). Azopt ® is a suspension, therefore, it needs to be shaken thoroughly before being applied. Side effects include stinging and a bad taste in the mouth, however they are generally well tolerated. Carbonated drinks may have a metallic taste while using these drugs. Applying pressure to the corner of the eye close to the nose will prevent the eyes drops from going down your tear duct into your nose and stinging your throat. These medications are not recommended for women who are pregnant or planning to become pregnant (barring exceptional circumstances). These drops are not suitable for patients who are allergic to sulpha-based medications. If you develop an allergic reaction to this drug (redness, itching, puffiness around the eyes) or are unable to tolerate them, you can stop them and call the office to arrange a prompt follow-up appointment. This is a parasympathomimetic drug that makes your pupil very small (miotic). It is an older drug but lowers eye pressure by essentially stretching open the drainage system. These drops are used 4 times per day (unless otherwise instructed) in the affected eye(s) or the gel is used at night in the affected eye(s). Usually the 1% strength is used to decrease likelihood of side effects. Possible side effects are blurred vision and dimming of lights, headache and allergic symptoms such as redness and itching. More severe possible side effects include retinal detachment and loss of vision (especially in very near-sighted people), precipitation of an angle closure glaucoma attack (rarely), shortness of breath, muscle tremors, severe sweating, excessive salivation, stomach pain, vomiting and diarrhea. These are rare side effects, especially with topical drop use. These medications are not recommended for women who are pregnant or planning to become pregnant (barring exceptional circumstances). If you experience any of these side effects, stop the medication and call the office for a prompt follow-up appointment. If you experience severe side effects, call 911 or go to your local emergency department. Xalacom ® - combination of timolol 0.5% and Xalatan ® (latanoprost 0.005%). Some of these drugs have different names in other countries. 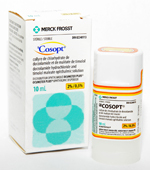 The application of Combigan ®, Cosopt ® and Azarga ® is every 12 hours to the affected eye(s). Azarga® needs to be shaken before use (since it is in a suspension form). 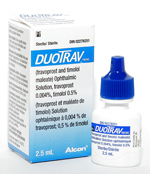 Duotrav ® and Xalacom ® are applied once daily to the affected eye(s) usually in the morning. Possible side effects of these combination medications are the same as for the individual medications (see above). These medications are not recommended for women who are pregnant or planning to become pregnant (barring exceptional circumstances). If you experience an allergic reaction (itching, redness, swelling of lids) or any intolerable or severe side effects, you can stop the medication and call the office for a prompt follow-up appointment. If you experience severe side effects like shortness of breath or facial swelling, you should go to your local emergency department immediately. These medications are in the class of drug called carbonic anhydrase inhibitors. These drugs are taken by mouth with food (Diamox ® or acetazolamide 250mg tablet 4 times a day or as instructed; Methazolamide 50-150mg twice daily or as instructed). They work by decreasing fluid production inside the eyes. They are diuretic medications, therefore side effects include going to the bathroom more often. They also may cause tingling in the hands and feet, a metallic taste after drinking carbonated drinks, weakness, fatigue, dehydration and weight loss with chronic use. These are sulpha-based drugs, therefore if you have a sulpha allergy, they are not suitable for you. They also may not be suitable if you are already on other diuretic medication. They may cause further kidney problems in people with pre-existing kidney disease, or a history of kidney stones. These are generally used as a short-term method for controlling eye pressure until surgery can be done. Rarely, they can be used chronically, for example in some people with advanced glaucoma who are poor surgical candidates. These medications are not recommended for women who are pregnant or planning to become pregnant.